Platypus Pub has gone beyond pouring great beers—they're now brewing great beers, too. Though the name is familiar—Platypus is a basement pub famous for serving hard-to-find beers—the Third Street bar has gone beyond pouring and recently entered the brewing arena with outstanding results. See the exceptional (and tongue twisterly named) Haste Ye' Back Scottish Wee Heavy (8.5% ABV) for proof of their brewing prowess. "We're selling the beer quicker than we can make it," said Platypus co-owner Tom Gilles. Because the pub lacks onsite-brewing space, they've been using the equipment of fellow newcomers, Bridge 99 (look for a new collaboration from the two breweries soon). Not content to make simple standards, the brewers at Platypus have more challenging and inventive recipes in mind for 2014. Coming down Platypus' pipes are an Imperial Chocolate Stout, as well as a whiskey barrel-aged brew, crafted in preparation for the Little Woody festival in late summer. "Our goal is to keep playing and having fun, and put out beers that are appropriate for the time of year." Gilles said. Availability: Platypus Pub, 1203 NE Third St.
Trevor Hawman, owner and brewer of Bridge 99, hasn't let his modest 1 1/2 barrel brewing system stop him from producing a diversity of beer—a tally already exceeding more than six high-quality beers. Hawman, who still works construction part-time to help pay the bills, named his beers after area flora, fauna and landmarks ("Bridge 99" is a Forest Service bridge that spans the Metolius River). His beers are as varied as their namesakes: Brown Trout Stout (7% ABV), Wizard Falls IPA (7.1 % ABV), Rock Crawler Red (7.2 % ABV), Candle Creek Ale (5.9 % ABV), Green Ridge Lager (6.5 % ABV) and The Hefeweizen (5.7 % ABV). Experimental brews, like the soon-to-be-released Ale Trail Vanilla Oatmeal Stout (6.9% ABV), should make Bridge 99 a nanobrewing top contender. Availability: On tap at Wubba's BBQ Shack, 63055 Layton Ave. If you missed the Winter Oblivion Ale and Backside Oblivion Ale—both were pouring at the inaugural Central Oregon Winter Beer Festival in December—all those who are cuckoo for craft beer can find Oblivion on tap at Broken Top Bottle Shop and Barrio. So far, owner/brewer Darin Butschy, along with his wife, Meghann, have a golden, pale, IPA, porter, stout and various seasonals available, though no store front or tasting room. Availability: On tap at Broken Top Bottle Shop, 1740 NW Pence Ln. and Barrio, 163 NW Minnesota Ave., and various growler filling stations. At RiverBend, formerly Rivals Sport Bar, the beer is reliably good, as is the food (order the sweet potato fries; seriously, take my word on it). But what separates the midtown brewery is RiverBend's devotion to sports and its whopping 16 big screen TVs. As far as the beer goes, veteran brewer Dan Olsen is operating with a 12-barrel brewing facility, located across the parking lot from the pub. The coffee-flavored stout (32 IBUs, 4.8%) is the standout, but Olsen also has five other sound offerings available: a blonde, IPA, red, Imperial IPA and WinterMint Stout. 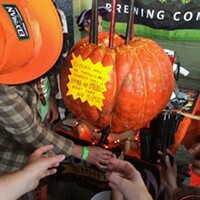 Availability: RiverBend Brewing, 2650 NE Division St. 541-550-7550. With fire engine red awnings and wide roll-top garage doors, Wild Ride Brewing's spacious 8,650-square-foot facility on Redmond's main (north) drag is proof that the little Central Oregon city is on the rise. 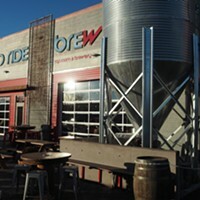 This is no nanobrewery: Wild Ride (opening spring 2014) will use a 20-barrel brewing system and operate a 1,000-square-foot tasting room and patio. Paul Bergeman, partner and brewmaster, previously worked for Hawaii's Kona Brewing Co. and Portland's Laurelwood Brewing Co. before that. Availability: (spring 2014) Wild Ride Brewing, 332 SW 5th St., Redmond. After one and a half years of sharing a brewing space in Redmond with Phat Matt's Brewing Co., Sunriver Brewing will soon be operating out of its own facility. With a 15-barrel capacity and a three-barrel pilot system for small batch brews, 2014 should be a banner year for Sunriver Brewing. By the first week of January, Sunriver Brewing should have three newly released offerings: Winter Ale Shred Head (a winter strong ale); Vicious Mosquito IPA; and Adopt a Trail Pale Ale (with proceeds to benefit various trail alliances like the Central Oregon Trail Association). Brewers there said they hope to make 50 different beers in 2014. Look for a spicy jalapeño pale ale and a gluten-free beer, among others. The rapidly expanding brewery has grabbed experienced brewmaster Brett Thomas, the award-winning former Silver Moon brewer who recently won a gold medal for the best oak-aged barleywine at the Great American Beer Festival. Availability: (onsite in early January) Sunriver Brewing, 57100 Beaver Dr., Building 4, Sunriver.